The Mystic Museum of Art is pleased to organize and host the only exhibition of Robert Brackman: Thinking in Color. The exhibition explores the full range of Brackman’s career – prominent society portraits, pastel figural studies, still lifes, and personal family portraits. 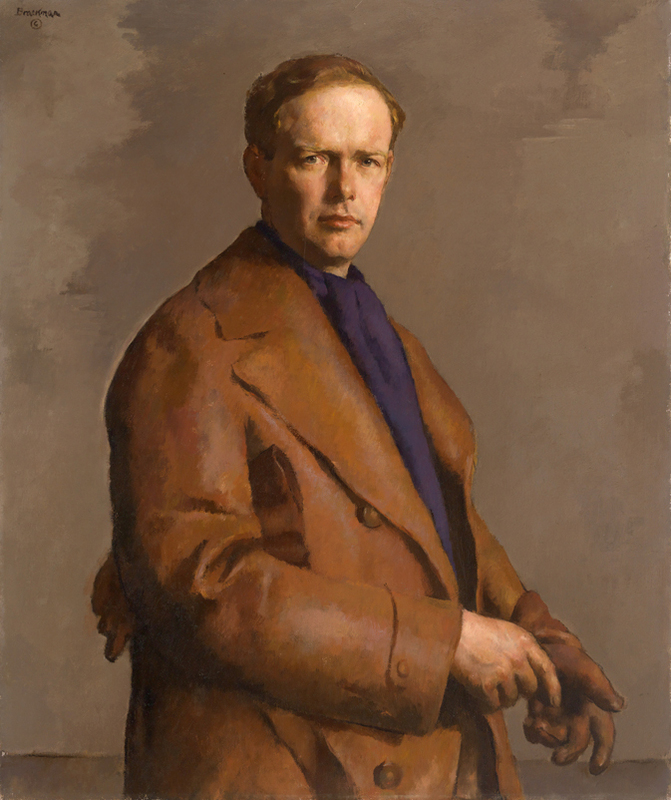 Robert Brackman first came to prominence when he was commissioned to paint the portraits of Charles Lindbergh and his wife, Anne Morrow Lindbergh (1938, Mead Art Museum, Amherst College). After completing these, Brackman became a sought after portrait painter – requests came in so frequently he had the ability to determine which ones he ultimately accepted, going on to paint John D. Rockefeller, three Ivy League presidents, U.S. military leaders, and a host of prominent Americans. Brackman, however, worked against the classification of a society painter. He created imaginary figural studies and delicately rendered still lifes throughout his career. Brackman was a student of Robert Henri and George E. Bellows. From them, he inherited the brilliancy and the possibilities of color. As a teacher, Brackman would often advise his students to “think in color”. His use of color was consistent throughout subject matter, creating form through color and not design. For example, the dress of his wife Francis in Portrait of the Artist’s Wife, Francis Brackman (1938, Mystic Museum of Art Permanent Collection) becomes a symphony of earth tones. In Still Life (1972, Lyman Allyn Art Museum, New London, CT) apples are created not through traditional modeling, but through the juxtaposition of warm and cool colors. A native of Odessa, Russia, Brackman immigrated to New York as a child and then ultimately settled in Noank, CT. His legacy as a teacher, in both Connecticut and New York, is profound, as was his commitment to the Mystic Museum of Art, in his life The Mystic Art Association, where he served as President. Robert Brackman: Thinking in Color will feature works from the Mystic Museum of Art’s permanent collection, important private loans, as well as significant loans from the Lyman Allyn Art Museum. The exhibition is made possible through the support of StoneRidge Senior Living Community and Celia Gallup, in honor of her father, Robert Brackman. The exhibition, curated by Erika Neenan, will be on view from June 16, 2017 – September 23, 2017. Robert Brackman, Charles A. Lindbergh, 1938. Oil on canvas, 36 1/8 x 30 1/8 in. Courtesy of Mead Art Museum, Amherst College, Amherst, Massachusetts.